If you’re a small business owner, you understand the challenge of balancing time spent on marketing your business and serving your customers. You should never have to choose one over the other, but maintaining that balance can be difficult. One of the most powerful tools any business owner can have in his marketing toolbox is a book. Could you race ahead of your competitors if you had an industry-specific book to hand out to customers, distribute at networking events, or use for training and recruiting? Of course, having a book to give to customers and prospects is great, but what if you’re too busy building your business to write a book? We’re glad you asked. Chart House Press has created a way for you to have a book for your business without having to invest the time and energy in creating it from cover to cover. Through our book leasing program, you can create a fully customized book in less than 30 days and be on the road to building your business in a whole new way. Step 1: Select the book title most appropriate for your industry or business. Pay a one-time leasing fee and sign a leasing agreement to get started. Step 2: After you pay your book leasing fee, an email will be sent to you with a link for you to complete information about your business and details you would like in your book. Take as long as you need to complete the information, and when ready, submit to an editor for review. Step 3: Work with a Chart House Press editor with experience in your industry. The fees for editing will vary depending on how much customization you prefer, how many revisions you make and how involved you would like to be in the process. Basic editing, formatting and uploading services run $1,000 (20-hours charged at the rate of $50 per hour). Most books can be completed in this time frame. However, if you require additional hours from our editing staff before your first book is completed, or if you would like to make changes at a later date, you may contact us through your Personal Client Portal and do so at any time. Step 4: With the help of your editor, change as little or as much of the book’s content as you need to fit your business. All edits, documentation and payments are made through your custom Client Portal. Step 5: Upload your own eye-catching cover or work with one of our professionals. Basic Cover Design services start at $350. Step 6: Submit your new book to Chart House Press for printing. We know it’s hard to believe as most publishing firms require in excess of $10,000 to get your business story in print. Because we have streamlined the process from start-to-finish, for just under $3,000 you can have your own book in less than 60-days! Since most of the information in your book has been written by someone other than yourself, you will not earn royalties for your work. Refer to the FAQ below about Book Leasing. You must change AT LEAST 80% of the books content. In addition to the Book Leasing Fee, you will be charged an additional $2,500 for the unconditional and exclusive lifetime right to print and have commission rights to remaining 20% of the data. Certain exclusions and/or limitations apply*. A processing fee of $250 will be charged to create your account and upload your work to Amazon Create Space. A fee of $125 will be charged for your books ISBN. Once uploaded into your Amazon account, you will earn 100% of the commissions paid out for your work! *Exclusions: The following content must either be removed or credited to the author if used in your printed work: The Hastings Hierarchy of Business Development (including but not limited to The Four Levels of Small Business). What Does Book Leasing Mean? You are granted a limited use right to use the data from one of our titles and customize as needed. All rights not expressly granted to the Lessee shall be wholly reserved by the Publisher. The Lessee acknowledges the general ideas and concepts contained in the Work is owned by the Publisher throughout the duration of this Agreement. By signing this Agreement and paying the one-time leasing fee of , the Publisher grants a limited use and rights of the content described as [NAME of Book] (“the Manuscript”) which is limited to the terms and conditions described below. Modify, in full or in part, all of the content in the Manuscript titled above as needed to use as marketing collateral for the purpose of self-promotion and improving company brand identify. Change the book cover as desired. Order copies of the book for 30% above cost throughout the duration of this Agreement. A $35 per transaction fee will apply. Sell or distribute copies, at any price desired, on the Lessee’s privately owned website, trade show or event. Arrange book signings and identify the work as the Lessee’s own. Transfer data from the book contents into a PowerPoint or similar program, for the purpose of presenting the material, in person or in an online meeting. This does not include eBook distribution or email of the book contents in any way. Request to create, through an authorized Chart House Press or ContractCoach vendor, an audio book or eBook of the book contents for the purpose identified in section (1i) above. Costs for production of said material will be the absolute and sole responsibility of the Lessee. If approved and the material is offered through online retail sites, other than the Lessee’s privately owned website, all payments, profits and/or royalties will be paid to Chart House Press. Become an official marketing representative of Chart House Press and/or ContractCoach and receive a referral fee* for closed transactions. *Refer to the Chart House Press Marketing Representative Agreement for details. Request, in writing, to an authorized Chart House Press representative to add the required International Standard Book Number (ISBN) and desire to distribute the book, eBook and/or audio book through retail sites for the purpose of receiving royalties*. To qualify, it must be determined that 80% or more of the book content has been modified by the Lessee and the content meets the Chart House Press minimum quality standards. Chart House Press reserves the right to approve or deny such request for any reason. *Royalty payments are defined in the Chart House Press Author Agreement. Publish, sell, gift, distribute, offer and generally exploit the book contents, whether in print, electronic, digital, audio, video, or any other form or format known or hereafter discovered or created, without the expressed written consent of an authorized CHP representative. Use anyone other than an approved Chart House Press editor, writer or contractor to make changes, modifications or adjustments to the Work at any time. All such modifications must be approved by an authorized representative of Chart House Press. Add a 9 or 13 digit ISBN to the manuscript without the expressed written consent of an authorized Chart House Press representative. Transfer, in part or in whole, the book title to another publisher or publishing company. To make and sell, and authorized others to make and sell, all translations, excerpts, other editions and/or versions and derivatives of the book, whether in print, electronic, audio, video or any other form now known or hereafter discovered or created. Allow third parties to read, use, copy or produce in any way, the book contents for the purpose of creating similar books, marketing material or advertisements without the expressed written consent of an authorized Chart House Press representative. Use an offset printer, including personally owned or leased, to print the book contents in an attempt to avoid ordering print copies from Chart House Press. Copies of completed Leased Books can be ordered through the www.ChartHousePress.com website at a rate equal to 30% above costs to print and ship to your location. An additional fee of $35 per order will be collected when books are ordered. How Much Will Copies Cost? The books size and weight. Type of paper and if color is used in the interior. Hard back or paper back editions. The number of copies ordered at one time. For “So You Want to be an Insurance Agent”, The cost to ship one book to Texas, the publisher cost would be $14.90. So, for an order of 100 books, you would pay $709.53 or $7.09 per book (518.87 * 1.3 + 35). Not only would book sales build your brand image, you could sell your books on your own website or events for $20 each earning over $1,200 in profit! Your leasing fee is due and payable before work will commence. After you submit your Questionnaire to the Chart House Press editor, he or she will contact you to discuss your project and determine how you would like to proceed further. After an estimate of the project has been agreed upon, you will pay 1/2 of the estimate to start the project and the balance upon completion of the first draft. Unless you have a cover design already created, as soon as you have completed your Questionnaire and the editor starts his or her work, you will be contacted by a Cover Designer. Your cover designer will go over project specifications and will provide an estimate for work completed. Your project will be billed 1/2 up front and the remaining 1/2 when completed. Jeff Hastings began his career with Farmers Insurance Group as a file clerk in 1985. Over a long and successful career, Jeff built an extraordinary business, consistently receiving top awards, including District Manager of the Year in 2005. He and the agents in his district achieved phenomenal success, and through So You Want to Be an Insurance Agent, he shares the keys to their success with others. Helpful business tools are included such as licensing guidelines, a business plan, employment contracts, an employee handbook, business forms and more. If you are serious about building your own insurance agency, So You Want to Be an Insurance Agent provides a complete system to develop, manage and grow your business. 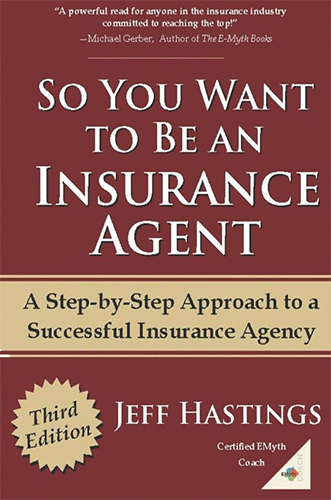 This book is a must-have marketing tool for every insurance agent, full of practical advice for consumers wanting to make educated decisions about their insurance.